Have you ever heard of the term JUULing? It refers to using a JUUL e-cigarette to heat up and vaporize liquid to be inhaled through the mouth. While there are various kinds of e-cigarettes on the market, the JUUL is by far the most popular of them all. The JUUL device was designed and created by James Monsees and Adam Bowen of PAX Labs who later formed JUUL Labs. A JUUL is a small hand-held device that has the outward appearance of a thumb drive and was created for the purpose of helping cigarette smokers make the transition away from cigarettes. 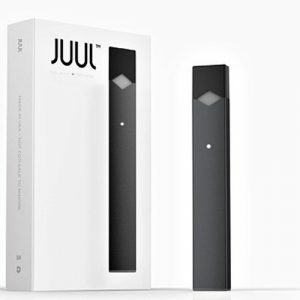 Brandishing a $49.99 price tag for its starter pack, a JUUL device uses nicotine salts found in leaf tobacco as its core ingredient and uses a closed loop temperature control algorithm designed to deliver the ideal amount of power at any given time to the JUULpod. The JUULpod, located at the top of a JUUL, is a refillable pod filled with glycerol, glycol, and other ingredients. The most notable of those other ingredients is nicotine. The nicotine content in a JUULpod ranges from 23mg to 40mp per pod, which amounts to the amount of nicotine found in 1-2 packs of cigarettes. As of today, JUUL Labs asserts that JUUL was created to provide an alternative option for adults who wished to no longer smoke cigarettes and that their product is not intended for anyone else. JUUL requires a minimum age requirement of thirty-five years old and a person must be a previous cigarette smoker if they wish to model in JUUL’s advertisement campaign. But this was not always JUUL’s strategy. Back in 2015, JUUL used models as young as twenty-one years old and they also advertised heavily on social media platforms—locations known for high teenage use. The popularity of the JUUL device and its use among teens was so widespread that the topic was the primary focus of an episode of the Comedy Central show South Park. This popularity amongst teens continued to rise and spread through the onset of 2018 until the Food and Drug Administration finally stepped into the picture. Initially, back in April of this year, the FDA sent a collection letter to JUUL labs seeking documents “relating to marketing practices and research on marketing, effects of product design, public health impact, and adverse experiences and complaints related to JUUL products.” Five months later, the FDA conducted a surprise investigation of JUUL labs seizing documents relating to the company’s sales and marketing practice. Finally, the FDA ordered that JUUL find a way to address youths having access to their devices or risk having their flavored pods banned in the country. In response, JUUL Labs pulled its flavored pods out of retail stores, created an age restriction system on its website, and deleted most of their social media accounts. All done in the effort to prevent youths from having access to JUUL devices. JUUL Labs is currently worth around $15 billion. These changes are a step in the right direction, but it appears to be too little too late. There is evidence showing that this outcome may have been the intention of JUUL labs. Dating back to 2015, management for JUUL Labs was apparently aware that the devices were appealing to teenagers. But nothing was done for nearly three years and even that came only after being threatened by the FDA. The damage is already done. For nearly three years teens have been using and becoming addicted to JUUL pods. JULL’s prevention measures in place will do little in terms of stopping teenagers from procuring flavored JUUL pods. At best, the age restriction will slow teens down from getting their hands on flavored JUUL pods. Even if the FDA fined the company JUUL would still come out ahead. It is well-known that nicotine is a profitable business and JUUL just enlisted almost an entire generation of people who will buy their products for many years to come. While the FDA determines its next course of action, we are left to determine the sincerity of JUUL efforts to thwart the use of teenagers using their products. Will Yakowicz, Why Juul, the Most Popular E-Cig on the Market, Is in Trouble, Inc. (May 11, 2018), https://www.inc.com/will-yakowicz/juul-has-a-problem-its-too-cool.html. Rakesh Sharma, Which Company Is Behind Popular E-Cigarette, JUUL?, Investopedia (December 7, 2018), https://www.investopedia.com/news/which-company-behind-popular-ecigarette-juul/. Alyssa Stahr, New Product: PAX LABS Introduces E-CIGARETTE JUUL, VapeNews (June 01, 2015), https://vapenews.com/vape-news/new-product-pax-labs-introduces-e-cigarette-juul/. Korin Miller, What Is Juuling And Is It Really That Bad For Your Health?, Women’s Health (September 12, 2018), https://www.womenshealthmag.com/health/a18377132/juuling/. David Hookstead, the new ‘south park’ episode will cover vaping. Check out the hilarious preview here, The Daily Caller (October 17, 2018), https://dailycaller.com/2018/10/17/south-park-vaping-tegridy-farms-preview-video/. Food & Drug Administration, JUUL Document Collection Letter, https://www.fda.gov/downloads/tobaccoproducts/labeling/rulesregulationsguidance/ucm605490.pdf. Jen Christensen, FDA seizes thousands of documents from e-cigarette maker Juul, CNN Health (October 2, 2018), https://www.cnn.com/2018/10/02/health/fda-juul-e-cigarette-surprise-inspection-bn/index.html. Anna Edney, FDA Threatens to Pull E-Cigarettes to Fight the Rise of Kids Vaping, Bloomberg (September 12, 2018), https://www.bloomberg.com/news/articles/2018-09-12/fda-threatens-to-pull-e-cigarettes-to-fight-rise-of-youth-vaping. ABC Chicago, Juul to eliminate social media accounts, stop retail sales of flavors, abc7 Chicago (November 13, 2018), https://abc7chicago.com/health/juul-to-eliminate-social-media-accounts-stop-retail-sales-of-flavors/4681584/. Olivia Zaleski, E-Cigarette Maker Juul Labs Is Raising $1.2 Billion, Bloomberg (June 29, 2018), https://www.bloomberg.com/news/articles/2018-06-29/e-cigarette-maker-juul-labs-is-raising-1-2-billion. Matt Richtel and Sheila Kaplan, Did Juul Lure Teenagers and Get ‘Customers for Life’?, NYTimes (August 27, 2018), https://www.nytimes.com/2018/08/27/science/juul-vaping-teen-marketing.html.